Download our latest apps from the App Store. 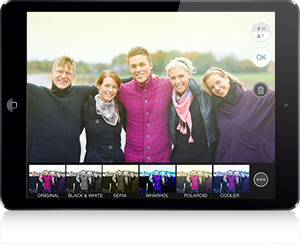 Snapshot is THE all-in-one photo app for experiential marketers! It is now faster and easier than ever to add photo marketing to your next campaign with Snapshot! Snapshot captures branded photos of consumers at events and offers multiple delivery options including branded email and branded retrieval microsite. 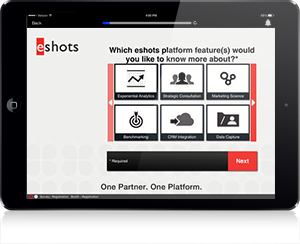 QuickCapture5 lets you upload survey data captured on your iPad to the eshots cloud. The sleek and intuitive design empowers experiential activation teams with several key features, including: syncing multiple consumer touch points, automatic survey download, and location-services based event selection. This app requires an eshots user account. eshots QuickPrize uses prize games to draw attendees into event displays. 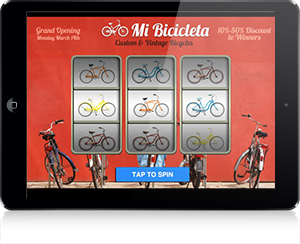 Prize setup and management screens allow experiential marketers to manage a mix of premium inventory for maximum efficiency. This app requires an eshots user account.